MEXICAN festival Day of the Dead will be celebrated at Gladstone's only Mexican restaurant --- with a ghost chilli hot sauce challenge. 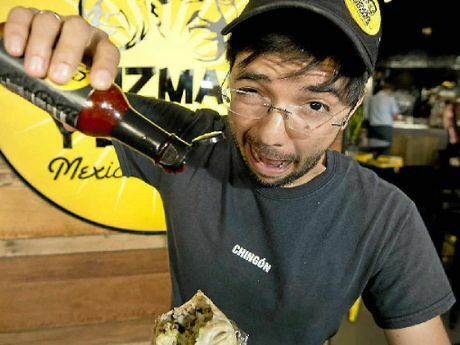 The ghost chilli is Mexico's hottest chilli and the folk at Guzman Y Gomez have imported the sauce for the special day. Day of the Dead brings families together to remember those who have died; traditionally it's on November 2 but will be celebrated at Guzman Y Gomez today and tomorrow. Gladstone firemen will be on hand to "put out the burning mouths", manager Dante Reynaud said. Dante has tried the hot sauce before but says he wouldn't do it ever again, even though he is Mexican. "The ghost chilli is the hottest chilli in Mexico so this sauce is the hottest we make," he said. "We don't sell it because it is too hot but we have (today and tomorrow) where people can come and try it. It doesn't start off to badly but it gets really hot after." THE ghost chilli sits on the second band of the Scoville scale that measure the spicy heat of chilli peppers. The chilli --- that has a rating of 1 million Scoville heat units --- is 400 times hotter than Tabasco sauce. In northeastern India, the peppers are smeared on fences to deter wild elephants. The ghost chilli is also used in curries and as a remedy to summer heat. It was once regarded as the hottest chilli in the world but has been replaced by the Carolina Reaper that has a rating of 1.56 million. The little bird's eye chilli has a rating of up to 225,000, jalapeño 8,000, Cayenne pepper, red chilli 750 and bell peppers 0. Is this Australia's angriest McDonald's customer?